The name George has been able to withstand the test of time. A popular name in the first half of the 20th century, it has still remained popular post world war II and even in the last 5 years, at a time in which names like Apple, Bacon, North and Wisdom reign the headlines. Even William and Kate named the future aire to the British Throne George (although I am convinced Elizabeth will live to 200 and shut out three generations of potentials kings). George Washington was the first president of the United States of America. George Orwell was one of the most prolific writers of the 20th century. George Carlin was a visionary in stand-up comedy. George Harrison was a Beatle. George was the star of a short lived early 70’s series about a loveable St. Bernard. George Lucas created Star Wars. George Washington Carver was considered a pioneer in the development of a number of food related products. George Weston became one of the most successful food entrepreneurs in Canadian history. George Foreman turned starving students into gourmet chefs. So, any restaurant that calls itself George has some big boots, or pans to fill. First, it doesn’t hurt that it has a number of awards and accolades from Zagat, open table and numerous Toronto magazines. Second, chef Lorenzo Loseto uses words like “émigré traditions” in his bio on the about page of the website, so it’s gotta be good. I had two opportunities to eat there in the span of a couple of weeks. The first was a small planning dinner and second was a group dinner with about 30 people. I apologize in advance for the qualities of the pics during the group dinner. The use of flash photography is not recommended when somebody is doing trying to explain the nuances of bone metabolism. As far as drinks go, George has a fantastic wine list with a heavy focus on France and Italy. In particular, they had a special feature in which 4 unique Beaujolais wines were offered by the glass. In addition, they offer a number of artisanal and traditional cocktails. I opted for the George and Tonic. It was served with a cute side bottle of Fever Tree tonic water (a premium UK brand which beat’s the hell out of Schwepp’s). The main flavours were grapefruit and lemongrass. 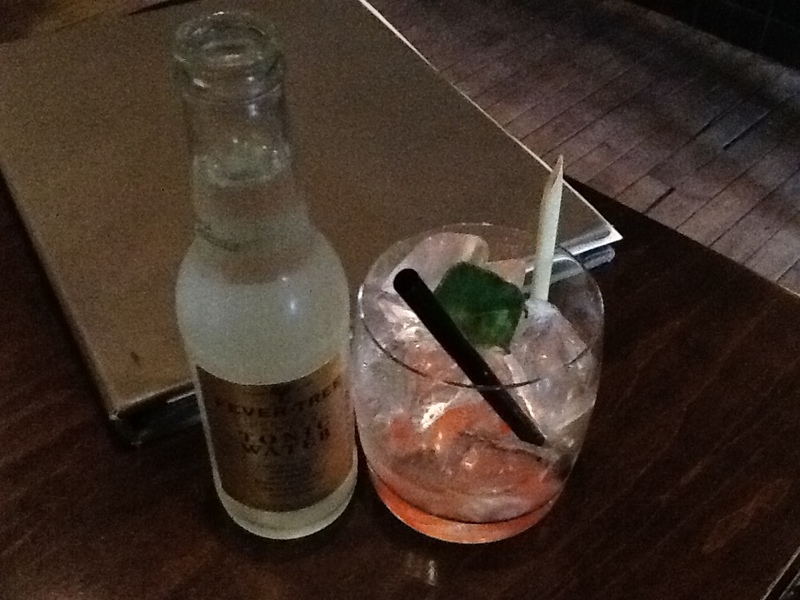 In fact, it was recommended that I chomp on the lemongrass after each sip to enhance the taste of the gin. Although I felt a bit like a panda bear, it was one of the better gin and tonics I have had. I would define the waitstaff as modestly pretentious which doesn’t surprise me given the clientele and vibe of the restaurant itself. The waiter we had the first night seemed quite impatient and unimpressed by our speed in ordering and remained stonefaced throughout the evening. 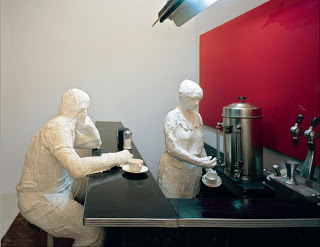 Even the bartender and hostess on night one seemed to be trying hard to fit the mold of a George Segal sculpture. The service for the group dinner was much better. At both dinners I had a starter salad. The first was a spring mix with grilled peaches. I chose this since it was the beginning of season and I don’t think anything beats a fresh Ontario peach. The dressing was abundant (maybe too abundant) and had a distinct acidity. 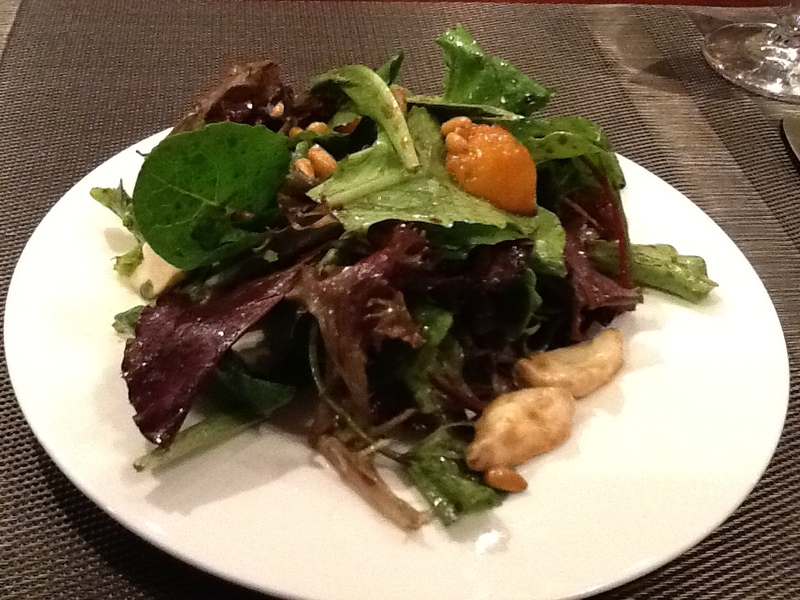 Although the pine nuts were abundant, I was a bit disappointed to only find two small peach slices amongst the jungle of greens on the plate, The boccachini cheese was also scarce but didn’t make much sense in the salad to begin with. The second salad had the same greens, the same dressing but this time had avocado and quinoa. Although it was a little heavy on the ginger, the taste and texture of each component blended to create a surprisingly hearty starter (no pic). 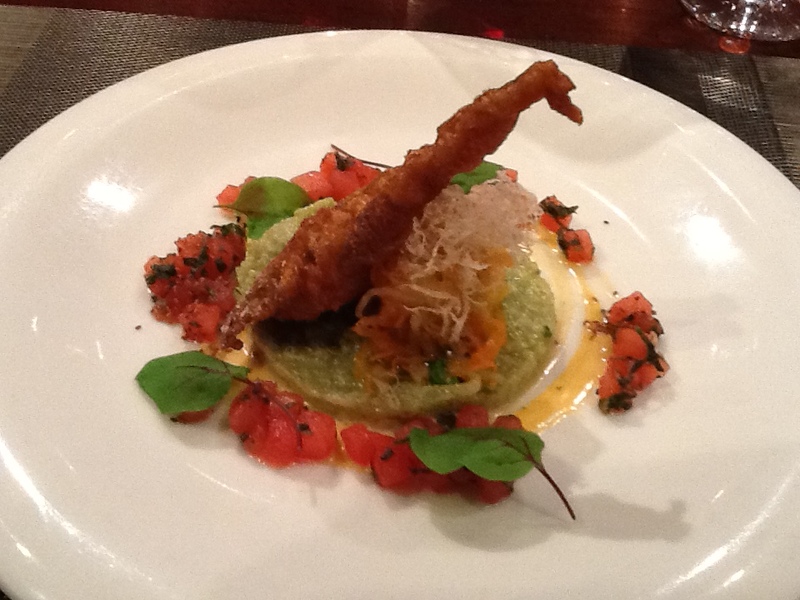 The first plate courses included the soft shell crab with watermelon and avocado quinoa and black cod with a cashew crust and roasted beets. Each were executed well. The crab maintained it’s moisture but I thought the coating was pretty average. There is a notion right now that watermelon goes with everything but I’m not sure it worked on this plate. It was sweet on sweet, so the dish just didn’t have enough contrast. 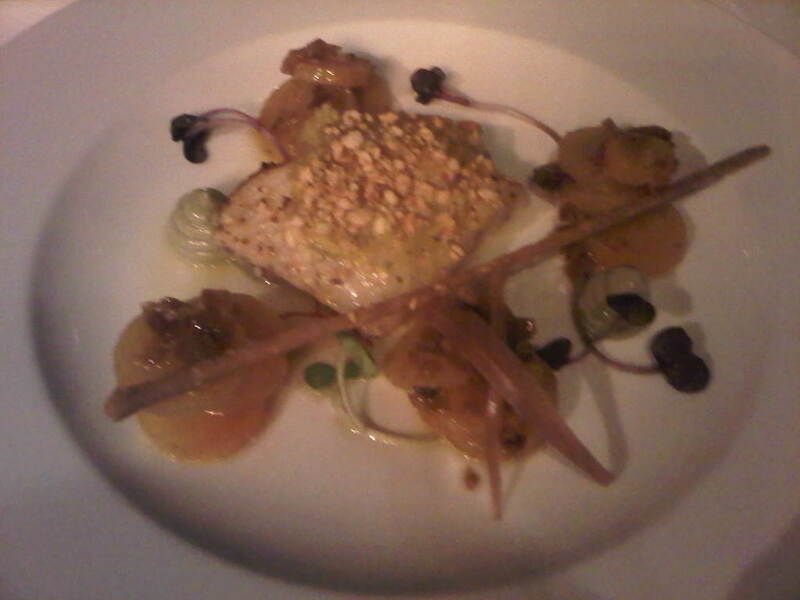 The black cod, on the other hand, was divine. The fish itself could not have been cooked better. It had a delicate, buttery taste that was complemented by the nuttiness of the cashews. The roasted beets contained enough earthiness to offset the sweetness so the dish worked well. 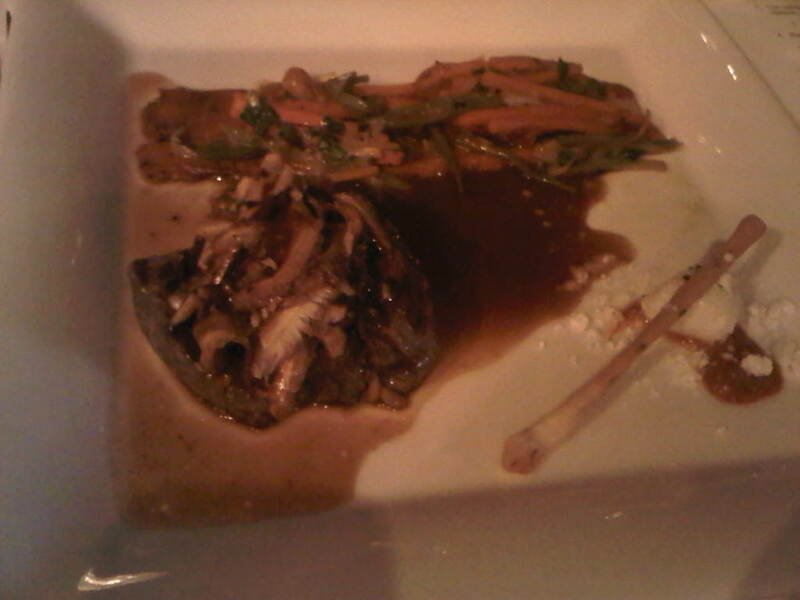 Mains included the wild boar with almond potato croquettes and veg plus beef tenderloin with mushrooms and sweet potatoes. The boar was incredible. It was grilled to the perfect doneness and was served on a bed of fantastic vegetables which included pearled carrots and some tender legumes. I was like inhaling and swallowing the savannah winds themselves. If necessary, I would have wrestled a lion over this chop but would have been happy with the vegetables in the event he won. The tenderloin was pretty standard, complemented with mushroom and sweet potato. The meat was not nearly as succulent as the cod or boar but it was a noble attempt in an effort to feed 30 people at once. It had a subtle anise or fennel flavour in the vegetables which, depending on your taste, could be a good or bad thing. 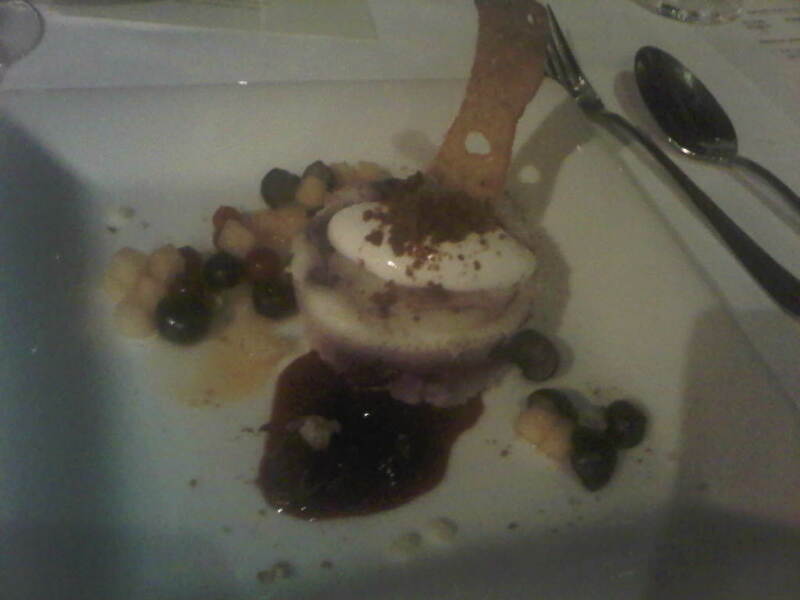 Desserts were a coconut custard and blueberry cheesecake. Although the custard was beautifully presented, it wasn’t as mind blowing as it looked. It’s sort of like that guy or girl you like to look at until they open their mouth and start talking. I could say the same about the cheesecake. I just didn’t want to lick either one all over when all was said and done. One might suggest that George could be a namesake for a number of famous Georges, past or present. 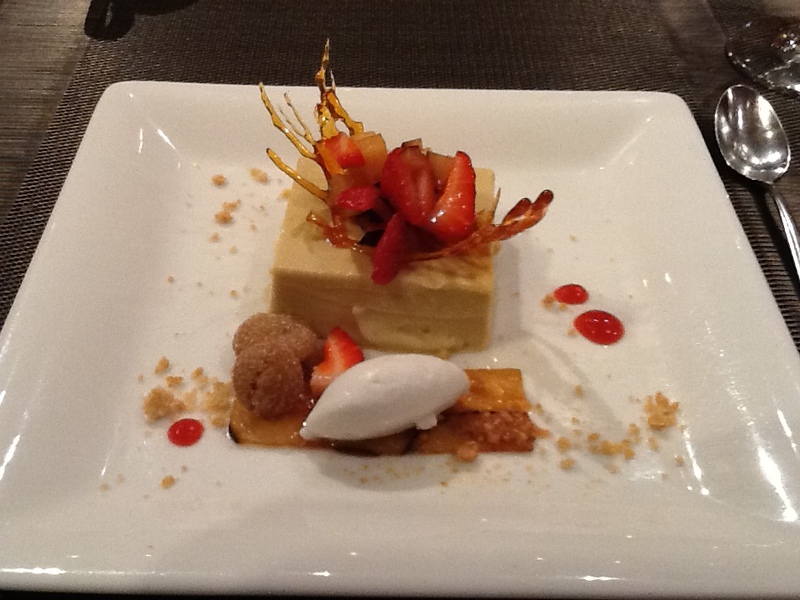 The innovative food preparation techniques and drink menu is reminiscent of a modern day George Washington Carver. 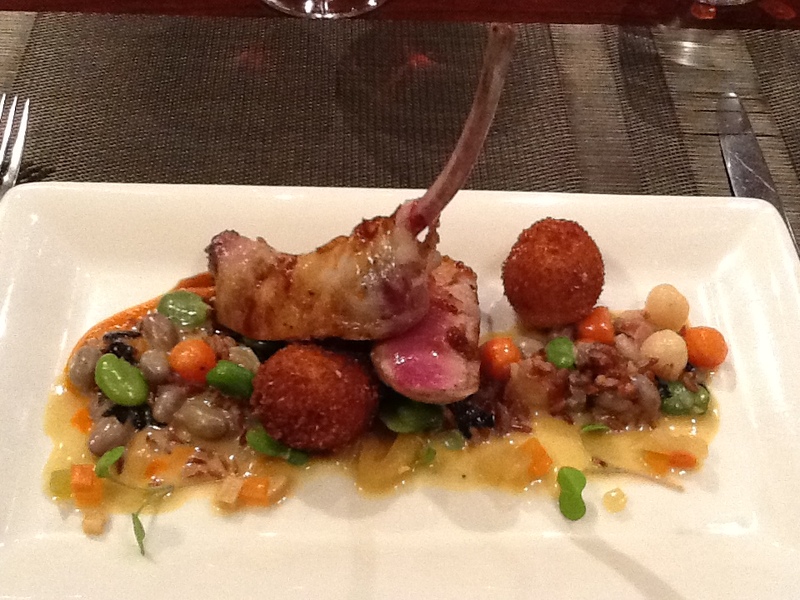 The lovely appearance of each dish could be synonymous with the face of George Clooney. On that note, even the prettiest stars don’t always make great movies. The black cod and the boar were like the descendants, the Ides of March, Three Kings or even Dusk Till Dawn (yes, I love that movie), while the tenderloin and the desserts are a bit more like Out of Sight, Spy Kids 3: Game Over, Solaris or Return of the Killer Tomatoes. The salads were like Batman and Robin, decent but nowhere near the best in the series. George is current and innovative and understands the importance of visually appealing food. The dishes look like Georges Seurat paintings. However, some of the waitstaff are as friendly as Georges St. Pierre during a pre-match weigh-in. Like a stunning work of art, an MMA pay per view fight or a good movie, you want to get what you pay for. If you follow their suggestions and go with the tasting menu or the three courses, plus dessert and a cocktail or glass of wine, your George Costanza wallet better be stuffed because it will run you over $100, but you will be treated to at least one or two memorable and stunning dishes, both from a visual and taste perspective. So pony up because after all….